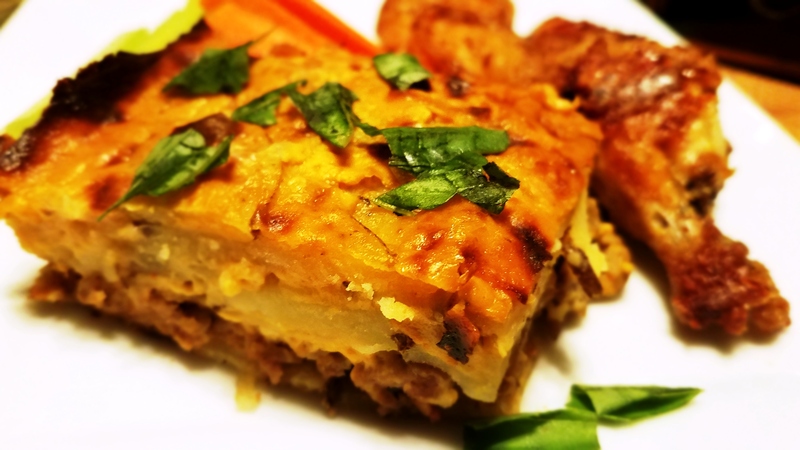 Fair Catch Scalloped Potatoes with turkey Italian sausage and fresh basil, plated. The Los Angeles Rams are going to the Super Bowl! Angelenos are rejoicing in the City of Angeles, my hometown. Yeah, I know the controversy about the infamous “non-call” for pass interference of the Rams during the NFC Championship game against the New Orleans Saints. It allowed the Rams to tie the score with a field goal in the final precious minutes of the game. In sudden death overtime, the Rams won it all after an interception and a winning field goal kick. So now the Rams will go against the New England Patriots in Super Bowl LIII or the 53rd Super Bowl game. The Los Angeles Rams go head-to-head with the New England Patriots in Super Bowl LIII. These are the details, cursorily recounted. They sting for many. For others, it’s a serendipitous outcome. But this championship game bell can’t be un-rung. 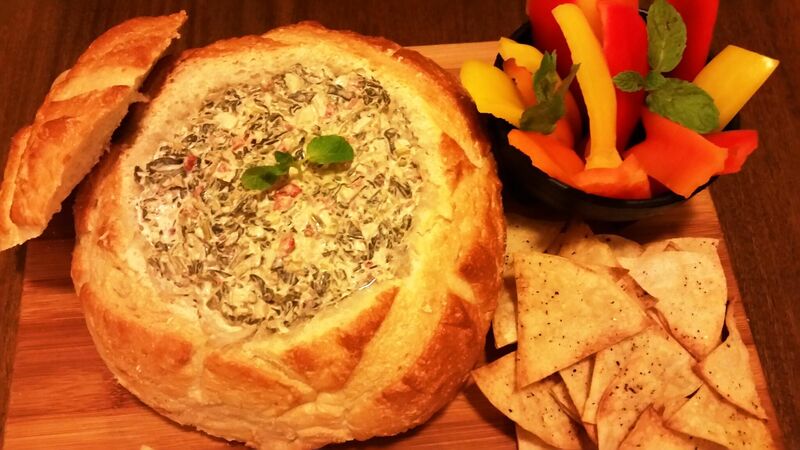 So we just got to move on – that is move on to planning our Super Bowl viewing party menu. 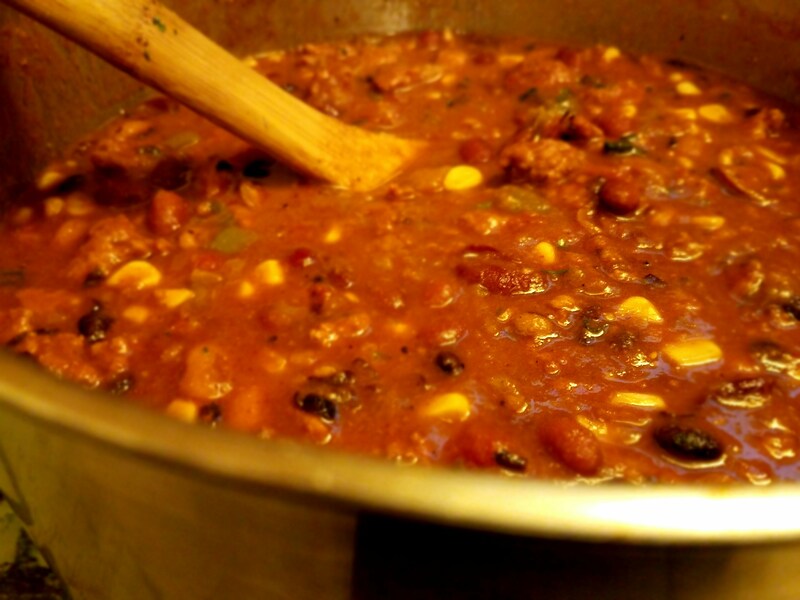 In my Super Bowl post last year, I featured my 5 Bean and Beer Chili recipe as the perfect complement for the New England Patriots and Philadelphia Eagles game. Chili is a good choice. It’s actually a great choice and considered required Super Bowl viewing party food along with tasty party wings. To my absolute surprise, I’ve learned that not everyone likes chili. Imagine that! It’s unbelievable to me. So if a bowl of hot and comforting chili is not the center piece of everyone’s viewing party experience, chili abstainers will be sidelined. 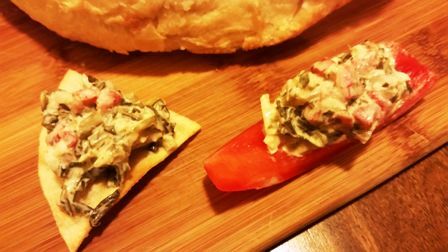 Since the Rams victory was such a stunner, my Super Bowl recipe offering this year has to be as well. It’s got to be something unexpected and somewhat of a game changer. My Fair Catch Scalloped Potatoes recipe is all that and more. It a fusion of scalloped and Au Gratin potatoes. The cream sauce is made with sauteed shallots and garlic, evaporated milk, a small amount of creamy and sharp Romano cheese, dried Italian herbs, a squeeze of concentrated tomato paste – and the pièce de rèstistance (or the most remarkable feature) is a turkey Italian sausage that is sandwiched between the first and second potato layer. It’s a hearty side dish with a delicate, creamy sauce that is heightened with the subtle savoriness of dried Italian seasoning and a hint of sharpness from the Romano cheese. It’s a goodie. 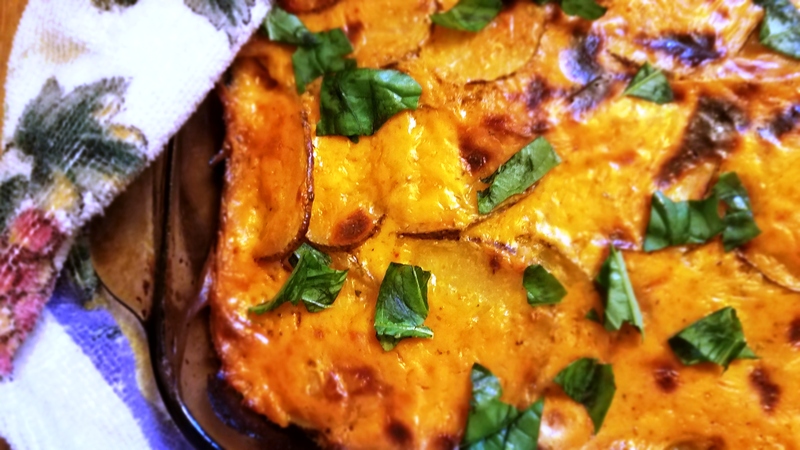 Fair Catch Scalloped Potatoes with fresh basil. For best results, make this recipe in a glass, 13 x 9-inch baking dish. You can cut it into 8 to 15 serving size squares. Garnish it with fresh basil. It can be served warm or at room temperature. Unlike most recipes I feature, this one is a little more than intermediate, and the total baking time is an hour and fifteen minutes. You can certainly bake it a day ahead and reheat at 300 degrees Fahrenheit until thoroughly warm. With all that said, it’s definitely worth it and there’s no pass interference here. This one simply goes straight up the middle for a tasty touchdown. Now – go team! A hearty side dish with a delicate, creamy sauce and an Italian twist. Remove casing from sausage links. Add 1 tablespoon of olive oil in a skillet and heat at medium heat. Place sausage in the skillet and break apart with wooden or silicone spatula. Turn the sausage over in pan until it browns and it is cooked. Drain the oil from the meat and set aside. Wash and scrub potatoes. Pat dry. Do not peel. Slice with a knife or mandolin 1/8 inch thick. Place sliced potatoes in bowl. Cover potatoes with water, add 1 teaspoon of salt and agitate water with your hand to distribute salt. Let potatoes stand in water. To make the sauce, melt butter over medium low heat. Add shallots. Cook until shallots are softened, about 2 minutes. Add garlic and cook another minute. Add flour and cook for 1-2 minutes. Stir in tomato paste. Reduce heat to low. Add milk, broth, Romano cheese, salt, red pepper flakes and dried Italian seasoning. Turn heat back up to medium and whisk until sauce begins to thicken. Continue to whisk until sauce is smooth. Remove from heat once the sauce is thicken. Grease a 9″x13″ baking dish. Drain potatoes. Place 1/3 of the potatoes in the bottom of the baking dish. Cover first layer of potatoes with cooked sausage. Pour a 1/3 of the cream sauce sauce over the sausage. Repeat with a second layer of potatoes and pour another 1/3 of the sauce over potatoes. End with a third layer of potatoes pour last 1/3 of cream sauce over the top. Cover and bake for 45 minutes. Uncover and bake for an additional 35-45 minutes or until golden brown and potatoes are tender. Broil for 2-4 minutes to obtain a golden top. Allow to rest for 15 minutes before serving. Garnish with fresh chopped basil. They gave it a good go this season. Their second year in Los Angeles has given the City of the Angels hope that perhaps one day we will make our long awaited appearance in the Super Bowl. So now we know the two teams that are poised to go helmet to helmet in the 52nd Super Bowl, set for Sunday, February 4th. The New England Patriots will make their 10th Super Bowl appearance. The Philadelphia Eagles will make their 3rd Super Bowl appearance. The Patriots won the title in 2017 and 2015. Its not surprising that the odds makers have tossed up their odds and predict the Patriots will win a back-to-back title this time around. Could this be a slam dunk for New England? Let’s talk chili because its gotta be part of your Super Bowl menu and its gotta be something to talk about in case the game isn’t. Features Modelo Especial Beer, known for its orange blossom honey aroma. Chock full of a variety of flavorful beans. Great balance of ground turkey and smoked chicken sausage. Thick, hearty and soul satisfying. For this recipe, you will need a large Dutch Oven pot. This recipes features a 6 quart pot. After its done, make sure to gather a few ramekins or small serving bowls and fill them with hand grated cheeses (cheddar, Parmesan, smoked Gouda), green onions, cilantro, sour cream, guacamole, olives, crushed tortilla chips, and chopped jalapenos. 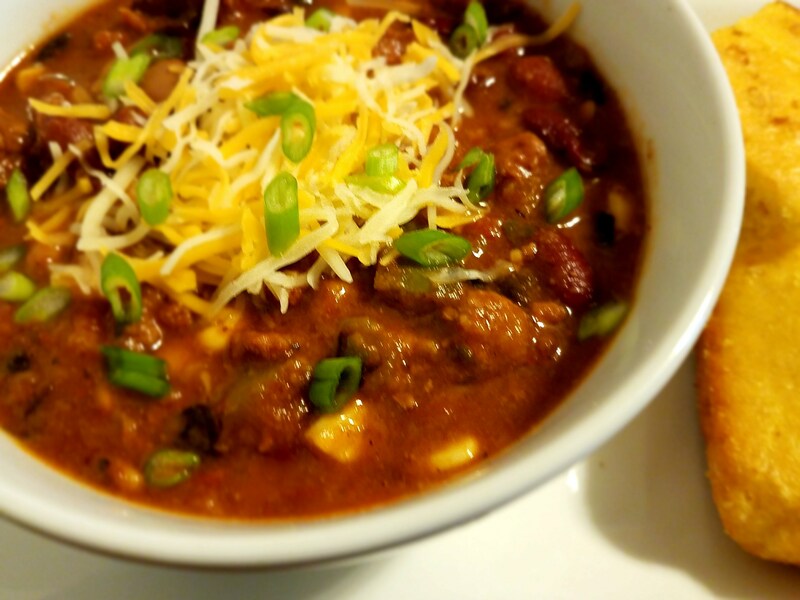 Your guests will love to customize their bowl of chili with their favorite toppings. When planning any gathering, party or event, pace yourself and plan ahead. This chili can be made the day before your Super Bowl soirée. I wouldn’t be too dismissive about the outcome of the big game. The City of Brotherly Love wants this title badly and they want it brought home on the wings of Eagles. I’m just relaying and saying. Here’s the recipe. Get cooking and go team! To a skillet set at medium heat, add two tablespoons of olive oil. Once heated, add bell pepper, red onion and garlic. Sauté until tender, stirring constantly, about 2 minutes. When done, remove from heat and place into a large Dutch oven. Cut smoked sausage in half, lengthwise. Then slice each lengthwise half into ½ inch slices. To that same skillet add the sausage and cook until lightly brown, stirring constantly. Add to Dutch oven. To that same skillet, add a little canola oil and pan grill the ear of corn. Rotate the corn in pan until it is lightly browned. Remove from heat, set aside and let cool. To that same skillet, add the ground turkey and cook until done, chopping and turning constantly. When done, drain, and add to Dutch oven. Open each can of beans, drain and add to Dutch oven. Add spices and herbs (cumin, chili powder, Chipotle Chili, chopped oregano, cilantro, sugar, salt, pepper), liquids (Simple Truth Fire Roasted Diced Tomatoes, small can tomato paste, low sodium chicken stock and Modelo Beer) and grilled corn cut from cob. Stir well to incorporate all the ingredients. Bring pot to a gentle boil, cover and reduce heat to low. Simmer 45 minutes, stirring occasionally. While the chili is simmering, place 12-15 saltine crackers in a plastic zipper storage bag. With a rolling pin or drinking glass, crush crackers until fine. You can use a food processor or mini grinder if you like. When chili is done simmering, taste and season with salt and pepper to your taste. Next, slowly stir crushed crackers into the chili until you achieve your desire thickness. Let stand 20 minutes and serve.